The Constitution of Norway was signed at Eidsvoll on May 17th in 1814 and by that declared Norway an independent nation. The celebration of this day began spontaneously among students and others from early on. After 1864, the day became more established, and the first children’s promenade was launched. This initiative was taken by our most famous writer; Bjørnstjerne Bjørnson, although Henrik Wergeland made the first known children’s promenade at Eidsvoll around 1820. A noteworthy aspect of the Norwegian Constitution Day is its very non-military nature. 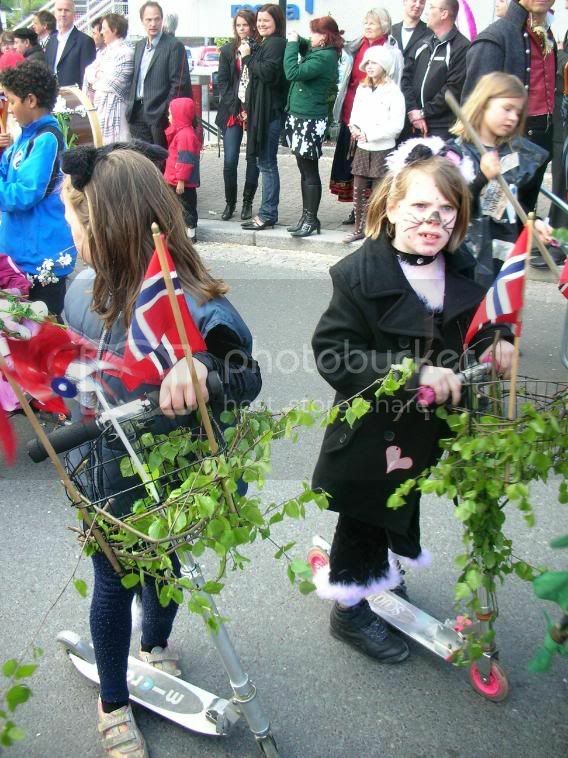 All over Norway, children’s parades with an abundance of flags form the central elements of the celebration. The highlight is the children’s processions, made up of school classes marching through the local community, led by the school band. Most of the children have their own small Norwegian flag to wave, and the route is lined with enthusiastic onlookers. After the procession there are games, entertainments and plenty of hot dogs and ice cream. 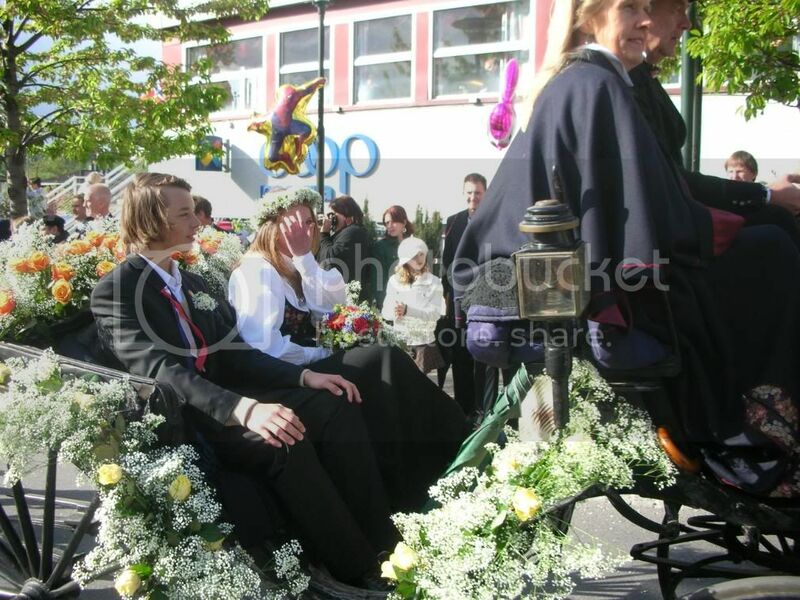 To the left: the youngest one dressed in Bunad, watching the parade. It’s a “different” parade in which almost all who are interested are allowed to participate! They are from the associations, sports teams, businesses and private individuals. Some represent activities and measures, other causes they burn for, or you can join to compete for the award for best performances. Those who participate in the parade have a positive and fun experience, and many feel that they have viewed their actions or association on a different and fun way. 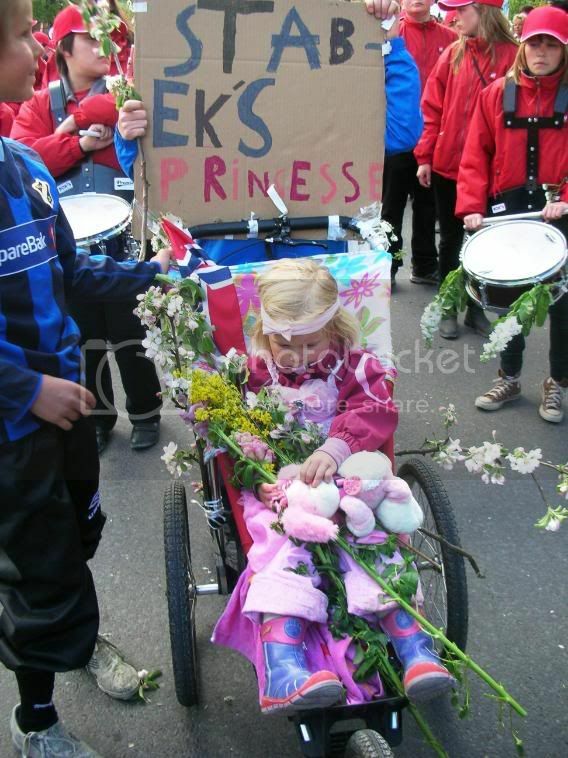 The main topic of the parade is, of course, flowers and one of the highlights is this year’s Flower Princess. The parade comity ensures that everyone who dresses up and participates in the parade gets some flowers for their performance and they are handed out to the audience too! 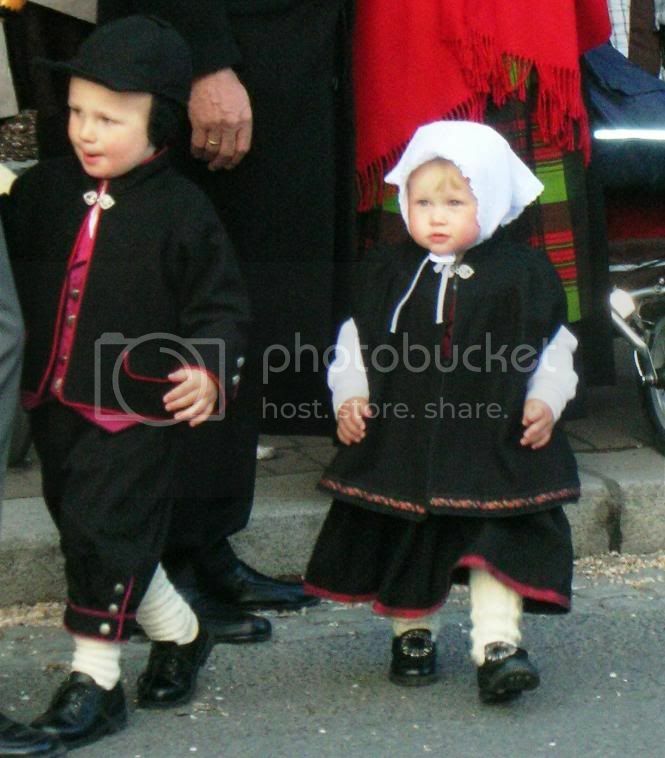 Oh I just love the children in their Bunad! They are precious!!! It looks like a wonderful day and a great success for all who attended the parade! Happy 17th of May, Renny!!! Thanks also for plugging me and for the lovely 17th of May Cake you made for tonight! Looks like a fun celebration! Yea, fun for children all ages! I missed this one out but oh well I can always celebrate this next year and finally being home again in Norway. Also it is nice that your site is up again meaning the server glitch was being fixed. See you next year Charles and you might know: Bergen even had the loveliest sunny weather this year! Yea: My Terella is back on the stage – thanks for being willing to help! I absolutely love the idea of a non-military national day. Canada is less military oriented than France (mostly people on Parliament Hill, the General governor speech…) but I don’t really enjoy seeing French army marching down the Champs Elysée. I know it’s tradition but… can’t we change a bit??? Yea and I know you have a special radar for this – thanks for never given up and for always commenting! The weather could never keep a Norwegian away from the parades and celebrations on Syttende Mai you know! Thanks to you too for coming back after the brake down and commenting! wow the children look adoorable all dressed up !!! hot dogs …ice cream …Diane’s cake …yum !!! Thinking of you; it would have been lovely to see you painting one of this children!! Cool ! u had a great fun :) when we have the independence parade there are just millitary guys doing random stuffs and some cultural dances but its great too see its not the same in other countries ! Great photos! It looks like you had fun despite the less than perfect weather. Wishing you an even better day next year! The weather is no barrier for Norwegians you know, but of course some sunshine could be nice next year! oh, Renny! i love the idea of an environment-friendly parade! it looks like a lot of fun, too. Its an important matter nowadays you know and fits in with a National Day quite well I think. Very nice to see that you have warmer weather up there too and everybody looks happy in the parade! Nice post, as always, Renny! Well it was mostly closer to freezing and raining, but spring has been quite nice and warm up until now. What beautiful flowers! You truly know how to have a celebration in Norway! :-) I hope you and Diane had a wonderful weekend. I know you would love the flower parade Lisa – would you come over next year and join? We had a great one and Diane took some time to prepare for her exam too. Well, it does look like you had some moments without rain luckily enough. Phew! What a weather you seem to have had lately! Worse than ours. This is ridiculous with such cold temperatures in the middle of May…. Great fun, the blomstertog. Love the fun objects in there. We visited something similar last weekend, the students from Royal Technical high school (Kungliga Tekniska Högskolan – KTH) had their yearly one with some great creations! Yea it stopped raining just before the parade, but other than that: the coldest and wettest Syttende Mai I can remember for years. Why don’t you come over to celebrate with us, Tor and Anne next year and we could have a Blogger’s section in the parade! sorry i am late in getting here but nonetheless allow me to wish you a happy may 17th! I always enjoy seeing the pictures of the parade and what a lovely theme. Ha en god Syttende Mai! Don’t be sorry Lime. Everyone is busy once in a while and I know you are one of my most trustful reader and commenter. Glad you liked it and thanks for your Norwegian greetings! Wow! What a great parade. It looks like you had allot of fun too. We have parades in the U.S. like that where anyone can enter and I just love them. People are so creative and come up with some amazine entries for the parade. Thanks for sharing this. Glad you liked it too – is your similar parade at the 4th of July then? Wow! what an interesting and fun parade! It’s so different from the parades we have in Singapore. It has come and gone so quickly, Renny, but because of you, it will be remembered! Thank you. I just love to refresh your memory about Norway you know – sad we don’t met last time you where here in May – I hope you’ll come back one day! I bet I could learn about all of Europe’s holidays, little by little, if I followed one great blog per country. Yours is definitely my choice for Norway – – and one of my summer projects is to find that one blog per country. I’m sure your blog and all of its links will be a great starting point. Blogsphere is the best way to explore the world you know! Thanks for your compliments – I’m flattered and its an encouragement to keep on. Keep us posted about your summer projects! That is quite an elaborate Parade, Renny. I love seeing all the costumes and the kids all dressed up….Very Very Festive! I haven’t been to any kind of Parade in years and years and years! There is nothing like a Great Celebration, is there? I love your post Renny! And really the slide show gives an idea of this lovely day and about the atmosphere in Norway! How cute the costumed children are! And nice to see how people are sensible about the environment! Finding your website really made my afternoon. You have no idea.